Available from most pharmacies. Click here to search Google. *Make sure you take a ‘Before’ photo, so you can compare your results. Ketone urine-testing strips, also called Ketostix or just ketone sticks … are small plastic strips that have a little absorptive pad on the end. 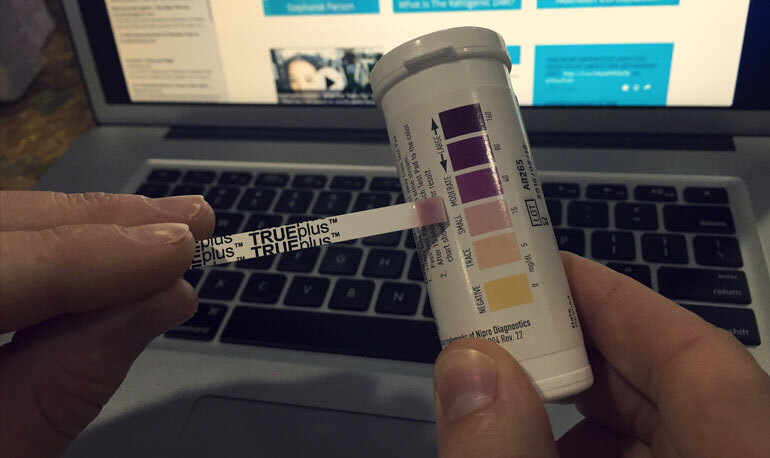 This contains a special chemical that will change color in the presence of ketones in the urine. The strips may change varying shades of pink to purple, or may not change color at all. The container will have a scale on the label, with blocks of color for you to compare the strip after a certain time lapse, usually 15 seconds. Most folks simply hold a strip in the flow of urine. However, the force of the flow can “wash” some of the chemical away, experts advise that a sample of urine be obtained in a cup or other container, then the strip dipped into it.